Hello again! 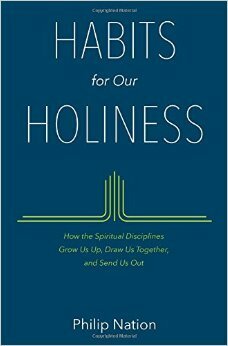 I just finished reading Habits for our Holiness by Philip Nation, and I want to share my thoughts on it. I received a copy of the book from Moody Publishers in exchange for an honest review. This is a book about living out the spiritual disciplines. Philip Nation not only went into depth in explaining the disciplines, but also gave advice and instruction in how to live out those disciplines. Nation gives all kinds of insight on everyday things that we should be doing and thinking about, such as various kinds of prayer, worship, and service. He also dedicated a chapter to fasting, which is something I have never learned about elsewhere, and I found that to be very interesting. He mentioned that all of these disciplines, while very personal, do not necessarily have to be private. For each discipline, he gave examples and instruction for both individuals and groups. Having never studied spiritual disciplines before, this book was really helpful and eye opening for me. Also, Nation writes with such a friendly voice, which makes reading, understanding, and relating to what he was saying much easier. The physical book itself is really nice. It’s normal paperback size and is of good quality. It’s a pretty short book, I read it in just a day, but it is full of great information. I gave this book 5/5 stars and it is something that I definitely recommend to anyone who would like to learn more about the spiritual disciplines or Godly living.